Make the most of any lull in the action. 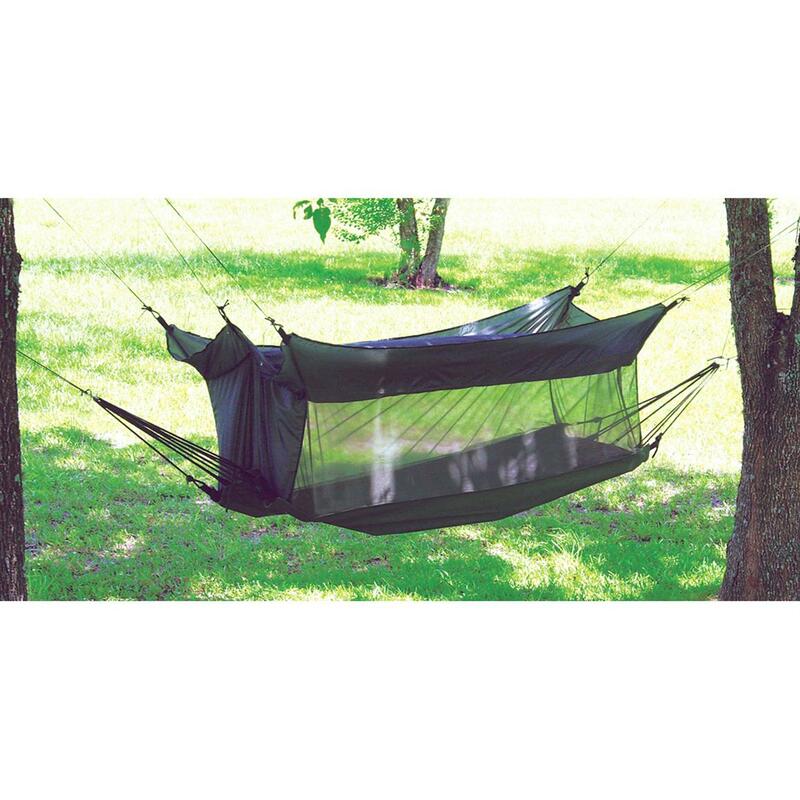 This Military-style Fox OutdoorTM Jungle Hammock is just the thing for bring a slice of paradise out to any isolated position. Lazy, lounging days are right around the corner. Fox Outdoor Jungle Hammock is rated 4.4 out of 5 by 12. Rated 4 out of 5 by RUSSELL from I bought this for my daughter, she loves it. She had trouble figuring it out at first but is happy with it now that it's up. Rated 5 out of 5 by THOMAS from As to the Jungle Hammock I have used them before and found them to work very well, (If you know how to set them up properly). Rated 5 out of 5 by TOM from My son wanted this for backpacking, seems to he is loving this hammock. Rated 5 out of 5 by MASON from We slept in these all last week and havent quite got them configured for comfort and water shedding. They seem to be excellent quality for the price and I was happy at how rugged the material is. Once we figure out all the side ropes, we should really get some use out of them. Rated 1 out of 5 by MARK from Very poor construction. Many thread ends get caught in the zipper and render it useless. Use this in your yard but don't count on it when out for a hike. Rated 5 out of 5 by GUYTON from Don't leave home without this gem if you are in a tropical/ subtropical climate. Screw setting up a tent. With this you stay high, dry, and catch a bit of the evening breeze to cut the stifling heat. Make sure you set this thing up once before you go out and depend on it though, because it is a bit complex to get up.... Add dark conditions and it miight as well be a ground cloth.